Heat 2 tsp vegetable oil in a pan and fry a chopped onion over a high heat for 5 minutes until golden. Add 1-2 tbsp Veeraswamy Medium Moglai Curry Paste and 2 x 400g cans Waitrose Tomatoes with Olive Oil and Chopped Garlic. Stir in ½ x 500g pack washed Waitrose Wholesome Red Lentils and ¾ x 500ml pack Cooks' Ingredients Vegetable Stock. Simmer for 25 minutes or until thick and the lentils are tender. 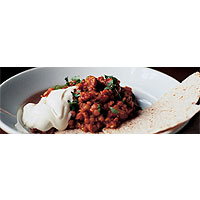 Garnish with plenty of chopped fresh coriander and serve with natural yogurt and chapatis or naan.